Exiled Preacher: Religion and Worldviews: The Way Forwards? 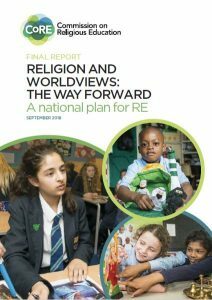 The Commission on Religious Education Chaired by Dr. John Hall, Dean of Westminster has published its report, Religion and Worldviews: The Way Forwards. Governors would do well to reflect on its proposals, which, if adopted by the DfE would involve substantial changes to the way in which Religious Education is taught in schools and academies. I am RE link governor in a LA maintained secondary school. In many ways the report is a solid piece of work, surveying the state of Religious Education in a fast changing educational environment. Put simply, the subject is in decline. The figures cited on p. 10 of the report tell their own story. The total number of RE GCSE entries has dropped from 425,000 in 2010 to 255,000 in 2018. In part the decline is due to the near extinction of the short course RE GCSE, for which many secondary schools used enter their students with a nod to locally agreed SACRE requirements. In 2010 there were 255,000 entries, now 26,000. The increased take up of the full course has in no way compensated for the flight from short course entries. The life was choked out of the short course RE GCSE because the qualification barley registered on schools' Key Stage 4 performance measure tables. That was the Department for Education's doing. Neither is RE included in the EBacc group of subjects, meaning it has to jostle for students' attention alongside a plethora of diverse options in the Attainment 8 'Other Element'. The government's academisation programme hasn't helped. Academies don't feel especially bound to follow the SACRE syllabus agreed by Local Authorities. According to the report, many academies don't teach RE at Key Stages 3 or 4 (see p. 8). On that basis it is proposed that a National Entitlement to a Study of 'Religion and Worldviews' replaces the current locally-based system. Things have certainly changed since the 1944 Education Act mandated the teaching of Religious Instruction in all schools. And that meant the study of the Christian faith, irrespective of whether or not a school was denominational in character. The report notes that the UK has seen massive demographic changes in the period following the Second World War. Not to mention huge shifts in religious adherence and social attitudes. With this in mind, the subject has for many years taken a multi-faith approach, with Islam, Buddhism and other world religions being taught alongside Chrristianity. Now, the report argues, RE must evolve still further in order to reflect the contemporary situation. Note the title of the report, Religion and Worldviews. It is proposed that 'worldviews' such as secularism and atheism, should be included in the RE syllabus alongside religious beliefs and practices. In a way this is a welcome development, underlining that secularism is not a neutral norm, but a belief system with its own set of presuppositions that should be subject to the same critical scrutiny as religious beliefs. But there are nevertheless concerns with the 'Religion and Worldviews' approach. One is that Religious Education is struggling for curriculum space as it is. If the subject is also to cover non-religious outlooks in some detail as well, the time devoted to studying religious faith will diminish still further. It could be argued that virtually every other subject on the curriculum is taught from a secular standpoint. Does God get a mention in Science lessons? Is History interpreted as the unfolding story of God's providential action? Do Geography teachers tell their students, 'The earth is the Lord's and the fullness thereof'? Um, no. Not unless we're talking about a school with a dedicated Christian ethos. Humanists UK and the National Secular Society have welcomed the report. Well, they would, wouldn't they? Besides, if students are going to understand life in modern Britain and where our most cherished values come from, they are going to need a solid grasp of the Christian faith. Secularism often piggy-backs on historic Christian teachings, while at the same time dissing the piggy. Ideas such as the unique value of each individual human being, and the notion of universally applicable human rights are rooted in the biblical teaching on human beings created in the image of God. Historian Tom Holland is currently working on a book that explores the Christian foundations of Western culture (see his article in the New Statesman on Why I was wrong about Christianity. Note also David Bentley Hart's Atheist Delusions: The Christian Faith and its Fashionable Enemies. Contemporary Western secularism cannot be understood unless it is set against the backdrop of a culture that has been permeated by Christianity. You would not have guessed this from the report, which is something of a lacuna, given that the commission that produced it was chaired by a high up Anglican ecclesiastic. I fully understand that Religious Education is not theology, which is my academic discipline. Theology proceeds from a position of faith in God's self-revelation seeking understanding. RE attempts to help schoolchildren understand various religious (and non-religious) beliefs and practices, without stipulating that any one of them is true. But that does not mean all belief systems are worthy of equal attention in terms of enabling students appreciate their own history and culture. The commission's approach signals a move away from the stance of the Education Act 1996, which says that RE should "reflect the fact that the religious traditions in Great Britain are in the main Christian, while taking account of the teaching and practices of other principal religions represented in Great Britain." In line with that, the Agreed RE Curriculum for Wiltshire aims to develop pupils' "knowledge and understanding of, and their ability to respond to, Christianity, other principal world religions, other religious traditions and world views". That seems about right to me. Where Christianity is mentioned in the report, which is rarely, it tends to be in the context of the numerical decline of the faith in the UK. This is used to justify a greater emphasis being given to other faiths and worldviews. The decline of Christianity is an undeniable fact, borne out by the latest social attitudes survey (here). But the figures need a bit of unpicking. Where churches have embraced theological liberalism, attendance is dwindling. More evangelical churches that hold to traditional Christian beliefs and values are growing, albeit slowly. It is certainly not the case that the world as a whole is becoming more secular. Christianity is the world's largest faith and is continuing to advance across the world, even in Europe (here). Christianity of an evangelical stamp is growing exponentially. In Mexico, to give one example from South America, evangelicals have grown from 2.1% of the population (800,000) in 1960 to over 8%, numbering over nine million by 2010. In China the evangelical church has grown from 2.7 million in 1975 to over 75 million in 2010. (Figures from Operation World, 2010). There is a danger with the 'Religion and Worldviews' approach that students will be given a parochial vision of religious trends that downplays the importance of Christianity as a vibrant, global faith. By all means teach Islam and Buddhism, secularism and agnosticism, even. But let's not neglect to inform our children of the incalculable influence of Christianity on our nation's story. Even Richard Dawkins has argued that the Bible should be taught in schools, "European history...is incomprehensible without an understanding of...Christianity" (here). The writings of William Shakespeare, Jane Austen and Thomas Hardy are full of biblical allusions that can't be grasped unless one is on nodding acquaintance with Scripture. It's difficult to agree that the 'Religion and Worldviews' proposals outlined here will chart the way forwards for RE. For the way forwards to be clear students need to be given a sense of where we have come from in terms of our national history and culture, and also a sense of where the world is heading in terms of global religious trends. That's not going to happen if the Christian faith is reduced to a bit part in Religious Education. How are we meeting our statutory duty to teach RE? How are we supporting our RE teachers and extending their subject knowledge?